Background: Three-column osteotomy is an effective means of correcting fixed sagittal plane deformities. Deformity correction surgeries may be associated with early postoperative neurological deficits often presenting as palsies involving the lumbar roots. The objective was to retrospectively assess a subset of our series of adult deformity correction surgeries and analyze neurological deficits and associated patient and surgical factors. Methods: Hospital records of 17 patients from a single center were examined. Inclusion criterion were adults (>18 years) who underwent a 3-column osteotomy (pedicle subtraction osteotomy) at the lumbar level for fixed sagittal plane deformities including positive sagittal balance, flat back syndrome, and posttraumatic kyphosis. These also included cases with associated degenerative lumbar scoliosis. Patients were divided in 2 groups: Group 1 with lumbar root deficit and Group 2 with no deficits. We examined the surgical details of the osteotomy, complications during surgery, and observed if the magnitude of correction in the sagittal or coronal plane bore any influence on the nerve deficit. Results: All 17 patients had a single-level resection except 1 patient who had 2-level osteotomy; 23.5% (4 of 17) developed nerve deficit. Nerve deficit presented as bilateral foot drop (1); unilateral extensor hallucis longus (EHL) weakness (2); and unilateral quadriceps weakness (1). The patient with quadriceps weakness partially recovered to functional strength. Two patients with EHL weakness fully recovered; however, the patient with bilateral foot drop did not improve. L5-S1 interbody fusion was done in 3 of 4 cases in Group 1 and 4 of 13 cases in Group 2. Conclusions: Nerve deficits after 3-column corrective osteotomies occurred in 23% cases. All but 1 case had significant improvement. Most nerve palsies are neuropraxia and unilateral and tend to recover. L5 weakness appears most common after high lumbar osteotomies. Significant correction of scoliosis at the osteotomy level (>50%) may be a reason for nerve palsy. Fixed sagittal imbalance is a painful and debilitating condition that can be defined as a syndrome in which the patient is unable to stand erect without flexing the knees and hips.1 With advancing age, progressive degenerative changes in the disc lead to gradual loss of lumbar lordosis. Over time distal lumbar segments and the lumbosacral junction may fail to compensate for positive sagittal balance. Pelvic alignment changes with worsening posture, finally leads to fixed changes in spinopelvic parameters: lumbar lordosis, pelvic tilt, sacral slope, and sagittal vertical axis. Fixed sagittal imbalance with alteration in these spinopelvic parameters relates to increased energy expenditure resulting in a declining quality of life.2,3 Therefore, correction of these parameters while treating sagittal imbalance is critical. Treatment must be individualized based on the cause, disability, and patient expectation. Surgical correction of the deformity may require 1 or more types of osteotomy to achieve a near normal alignment of the spine. Corrective osteotomies include the Smith-Peterson Osteotomy (SPO) that is based only on posterior column shortening and provides angular correction of approximately 10 degrees at each level.4–12 Three-column osteotomies are another option and include: the pedicle subtraction osteotomy (PSO), vertebral column resection (VCR), hemivertebra excision, and extracavitary corpectomy. These procedures involve sequential removal of the vertebral body ranging from simply removing the pedicles and decancellation of the vertebral body through a PSO to a complete disarticulation of the deformed spine through a VCR. A PSO has been reported to result in a correction of approximately 30 degrees.13–22 Depending on the severity of the deformity and the familiarity of the procedure, the surgeon may choose one osteotomy over another or a combination of osteotomies. Deformity correction surgeries may be associated with early postoperative neurological deficits often presenting as palsies involving the lumbar roots. The purpose of this current study was to retrospectively assess a subset of our series of adult deformity correction surgeries and analyze neurological deficits and associated patient and surgical factors. A retrospective data analysis of patient records was completed from a single academic medical center after institutional review board approval. Adult patients (>18 years) who underwent a three-column osteotomy limited to a PSO for fixed sagittal plane deformity were included. Surgeries were performed between the years 2008 and 2011. All patients had a follow-up for 4 or more years for the assessment of recovery from any deficit. Patients with neuromuscular deformities or pre-existing neurological deficit were excluded. Details of the surgery and radiological parameters were studied and compared. The etiology of deformity in our series included previous lumbar surgeries with flat back and degenerative sagittal imbalance. A total of 17 consecutive patients were included in the study. This included 7 males and 10 females. Our surgical goal was to restore sagittal balance and to get the C7 plumb line to within 5 cm of the posterior aspect of L5-S1 disc space. PSO was done in all the cases. The level of osteotomy was based on surgeon preference. In brief, instrumentation was completed with pedicle screws except at the planned level of osteotomy. At the level of osteotomy, wide central decompression was completed. This included the lamina at the level of osteotomy and part of the lamina caudal and cephalic to it. In case of previous decompression, an attempt was made to remove/debulk the scar tissue as much as safely possible. Transverse processes were taken down with an osteotome. The pedicle was taken down to the level of the body. Decancellation of the body was completed in the posterior two-thirds. The lateral vertebral wall was taken down with a burr or kerrison. At this point, a temporary stabilizing rod was placed, and the posterior vertebral body shell was taken down with a footed tamp. Closure of the osteotomy was done gradually by compression across the osteotomy. This was achieved by using compressors bilaterally over the temporary rods and gradually closing the gap (Figures 1 through 4). This process was done slowly; and at each step, a Penfield dissector was used to confirm there was no obvious dural compression. Instrumentation was finally locked once the position was confirmed. At the end the osteotomy closure, a nerve hook or a Woodson elevator was passed through the exiting root and underneath the lamina above and below to confirm there was no residual neural compression. For the majority of the patients included in this study, additional fusion was extended down to the pelvis. L5-S1 transforaminal lumbar interbody fusion (TLIF) was done in cases where additional support to the construct distally was considered necessary. Neuromonitoring was used in all cases that included somatosensory evoked potentials (SEPs), free run electromyograms, and motor evoked potentials (MEPs). Intraoperative lateral image with pedicle screws placed (except at L2). Intraoperative image of pedicle subtraction osteotomy at L2 showing closure of osteotomy over temporary rods. Preoperative standing lateral x-ray showing flat back deformity, sagittal vertical axis of +16.2 cm. Postoperative standing lateral x-ray with pedicle subtraction osteotomy at L2, sagittal vertical axis of +4.2 cm. Detailed hospital records and clinic records were reviewed. A postsurgical deficit was measured as a loss of 1 grade below the presurgery motor strength. Assessment was completed immediately after surgery (after adequate pain relief), postoperative day 7, then at 6 weeks, 3, 6, and 12 months and at last follow-up. The cases were divided into 2 groups, Group 1 with neurological deficit and Group 2 with no deficits (Table 1). A record was made of any intraoperative complications, neuromonitoring changes, and radiological parameters (Tables 2 and 3). All patients developing a neurological deficit after the surgery had a computed tomography (CT) scan done to assess for any implant malpositioning or any residual nerve root compression requiring revision. The data were entered into a master chart. The data in the 2 groups (Group 1: with neurodeficit, Group 2: without neurodeficit) were analyzed using analysis of variance and χ2 tests. Statistical significance value was taken as P < .05. No patients were lost to follow-up. Four patients out of the 17 patients developed some form of nerve root deficit after the surgery (23.52%). The most common site for the PSO procedure was L2. All cases had an osteotomy at 1 level, except 1 case in Group 1 that had a double level PSO at L2 and L3 (Table 2). In the 4 years of the surgical study period under consideration (2008–2011), we looked at the distribution of cases and the neurological deficit (Table 4). Neurological deficits included 1-sided L5 weakness in 2 cases, bilateral L5 weakness in 1 case, and unilateral quadriceps weakness in 1 patient (Table 5). All patients with a deficit had a L5-S1 TLIF completed at the setting of their surgery. None of deficits were identified by MEPs or SEPs during intraoperative neuromonitoring. Unilateral neurological deficits improved to fully functional recovery at around 6 to 12 weeks' follow-up period (Table 5). The patient with the bilateral foot drop did not improve by the latest follow-up in this study. There was also no bowel and bladder involvement. The patient with the quadriceps weakness also had lumbar scoliosis and partially recovered to functional strength. Interbody L5-S1 TLIF was done in 3 of 4 (75%) cases in Group 1 compared to 4 of 13 (30.76%) cases in Group 2. In Group 1, the 3 cases that developed a neurological deficit, 1 patient had a quadriceps weakness (case 2), and 2 patients (3 and 4) had partial unilateral weakness involving L5 root. Time of surgery vs. neurodeficit. Postoperative CT scans for Group 1 cases showed no implant malpositioning, bony spikes, or nerve root compression that could explain isolated nerve root injury and would have required revision surgery. The average change in lumbar lordosis and pelvic tilt was comparable (Table 3). Pelvic incidence in both groups was comparable: 51.5 ± 4.35 degrees in Group 1 and 53.6 ± 12.48 degrees in Group 2. Mean correction in lumbar lordosis was 67% in Group 1 compared to 60.5% in Group 2. Changes in the pelvic tilt and sacral slope were comparable. The mean correction of scoliosis in Group 1 was 78.7% compared to 55.08% in Group 2. The average correction at the osteotomy level was 18.5 (12–29) degrees in Group 1 and 17.5 (12–30) degrees in Group 2. One patient in Group 1 had a lumbar scoliosis more than 30 degrees (33 degrees) with apex at L2-3 disc space, which was corrected to 7 degrees after surgery (correction of 78.78%). This patient developed ipsilateral side quadriceps weakness. Lumbar scoliosis (>30 degrees) was seen in 4 cases in Group 2 with the average correction of 29.23% (25.5%–36.36%) (Table 6). Patients with lumbar scoliosis >30 degrees. Most of the patients in our series had previous lumbar spine surgery; all patients in Group 1 and 9 cases in Group 2 (Tables 5 and 7). All 4 cases in Group 1 had previous decompression done at the level of the PSO. Previous decompression was seen in 5 of the 13 cases in Group 2 (38.46%). As illustrated in Table 4, most patients recovered from their deficits by 6 weeks with maximal recovery in this series seen at 3 months. No additional recovery was seen after this time with all patients having at least a 4-year follow-up. In the present review of our cases, we found early lumbar nerve root neurodeficit occurred in approximately 23% cases. Most of the deficits were unilateral and temporary; and recovery occurred by 12 weeks postoperatively. Most of these deficits were L5 and potentially may have had some relationship to an iatrogenic nerve injury at the time of surgery especially during interbody fusion. We noted of the 4 cases that developed a deficit, 3 had a L5-S1 TLIF procedure done. Of these 3 cases, 1 had quadriceps weakness and the remaining 2 had unilateral L5 weakness that was contralateral to the side of interbody cage insertion. Though, it is not possible to completely rule out the possibility of an iatrogenic root injury, we believe that contralateral cage placement does make it unlikely for it to be the primary reason of weakness. One patient with bilateral L5 weakness did not improve. We believe that the presence of a previous decompression at the level of the planned osteotomy and major correction of lumbar scoliosis >30 degrees were risk factors for developing a deficit, but our small numbers make it difficult to prove statistically. Bridwell et al14 found 5 of their 33 consecutive patients had transient deficit (15.2%). None of the patients in their series had a permanent deficit. Yang et al22 in their series of 28 patients found neurodeficit in only 3.6% cases. Ahn et al13 had 12% neurological deficit and found that despite neurological complications, the patients had improved functional outcome scores especially if the final lumbar lordosis was >25 degrees. In a similar study, Kim et al16 included 36 patients of ankylosing spondylitis had an 11.1% incidence of a deficit, 4 of which included transient radiculopathy and 1 had spinal cord compression secondary to a bone spike. One important factor that also influences the outcome is the time of the surgery in the surgical time frame (2008–2011: 4 years). In the first 2 years, 1 case developed a deficit of the total 4 cases operated (25%). In the second half of this period, 3 cases developed a deficit of the 13 operated (22%). Due to small numbers in Group 1, it is not possible to draw a statistical significance. The time of surgery, however, does not appear to have influenced the outcome in our study considering most cases were done in the latter 2 years of the surgical time frame under consideration. Buchowski et al23 found a nerve palsy rate of 11%. Our study defined a deficit as a loss of any motor strength that included patients who lost a single motor grade. The study by Buchowski et al23 defined a deficit as a loss of 2 motor grades, while other studies used more subjective definitions of a motor deficit. These were also surgeries done at the start of clinical practice for the 2 surgeons performing the procedures. Other series have found that experience was not predictive of a deficit.23 Our study also differs in that all patients were treated for degenerative lumbar pathology as opposed to the inclusion of other pathologies, such as ankylosing spondylitis, polio, and posttraumatic deformities. Buchowski et al23 found the highest incidence of deficits in the degenerative lumbar pathology subgroup. Additionally, it is also important to ensure there is no posterior bony shell with a curette or a Woodson elevator in front of the thecal sac before closing the osteotomy to avoid any bony spike impingement.14,23 We always followed a gradual and slow closure across the osteotomy in small fractions to monitor for electromyography (EMG), as well as SEP and MEP changes. Importantly, slow closure of the osteotomy is less likely to result in subluxation. We also preserved the anterior third of the body at the time of decancellation. The anterior third of the body gives away spontaneously at the time of closure of osteotomy and acts as a wide base to prevent accidental subluxation and a wide area for fusion. Re-exploration and widening of laminectomy is required at times in cases having neurological deficit diagnosed either postoperatively or during the wake-up test.13,17,23 All patients who had a neurological deficit underwent a CT scan after the surgery to look for any implant malposition or a bony spike. None of the cases required re-exploration in our series. Of the radiological parameters, the sagittal parameters (lumbar lordosis change, angulation of the osteotomy, and change in pelvic tilt) did not appear to contribute to the neurological deficit. We found that previous decompression at the level of osteotomy was a potential risk factor contributing to nerve palsy distal to level of the PSO. Additionally, major correction of scoliosis (more than 50% in scoliosis >30 degrees) at the level of the osteotomy may be a risk factor for developing nerve palsy on the convex side involving the ipsilateral exiting root. Unfortunately, our numbers are too limited to make any definitive conclusion. With regard to recovery, most recovery was seen early at 6 weeks to 3 months. No real change in neurological status was seen with prolonged follow-up of 4 years. The specific focus of this paper was on neurological deficits and identifying potential predictive factors for development of deficits and looking at the course of recovery. As all of these procedures are somewhat unique, this poses a challenging task. Though our numbers are small, we believe our follow-up does provide information about recovery, which adds to the information available to surgeons in counselling patients about this complication. In conclusion, nerve root deficits after a 3-column corrective osteotomy occurred in 23% cases. All but 1 case had significant improvement. Most nerve palsies are neuropraxia and unilateral and tend to recover. L5 weakness appears to be the most common neuropraxia seen in our series and may be related to concomitant procedures such as TLIF at L5-S1; however, scar and nerve root tethering may be another possible explanation. Our distribution of deficits was similar to that seen by Buchowski et al23; however, in that study anterior column support at L5-S1 was provided by both TLIF and anterior lumbar interbody fusion in different patients. Significant correction of scoliosis at the osteotomy level (>50%) may be a reason for nerve palsy as well. Disclosures and COI: There were no sources of funding or grants from any source. This work had institutional review board approval. Pedicle subtraction osteotomy for the treatment of fixed sagittal imbalance. J Bone Joint Surg Am. 2003;85-A(3):454–463. Correlation of radiographic parameters and clinical symptoms in adult scoliosis. Spine (Phila Pa 1976). 2005;30(6):682–688. Correlation of adult spinal sagittal imbalance and life quality. [in Chinese] Zhonghua Yi Xue Za Zhi. 2012;92(21):1481–1485. Corrective osteotomy of the spine in ankylosing spondylitis: experience with 66 cases. Clin Orthop Relat Res. 1986;(208):157–167. Oligosegmental correction of post-traumatic thoracolumbar angular kyphosis. Spine (Phila Pa 1976). 1993;18(13):1909–1915. Vertebral osteotomy: technique, indications, and results. J Bone Joint Surg Am. 1948;30A(3):680–689. Combined single stage anterior and posterior osteotomy for correction of iatrogenic lumbar kyphosis. Spine (Phila Pa 1976). 1988;13(3):257–266. Osteotomy of the lumbar spine for correction of kyphosis in a case of ankylosing spondylarthritis. J Bone Joint Surg Am. 1946;28(24):851–858. Osteotomy of the spine. Clin Orthop Relat Res. 1969;66:70–76. A technique for lumbar spinal osteotomy in ankylosing spondylitis. J Bone Joint Surg Br. 1985;67(2):204–210. Osteotomy of the spine for correction of flexion deformity in rheumatoid arthritis. Clin Orthop Relat Res. 1969;66:6–9. Lumbar osteotomy for correction of thoracolumbar kyphotic deformity in ankylosing spondylitis: a structured review of three methods of treatment. Ann Rheum Dis. 1999;58(7):399–406. Functional outcome and radiographic correction after spinal osteotomy. Spine (Phila Pa 1976). 2002;27(12):1303–1311. Complications and outcomes of pedicle subtraction osteotomies for fixed sagittal imbalance. Spine (Phila Pa 1976). 2003;28(18):2093–2101. 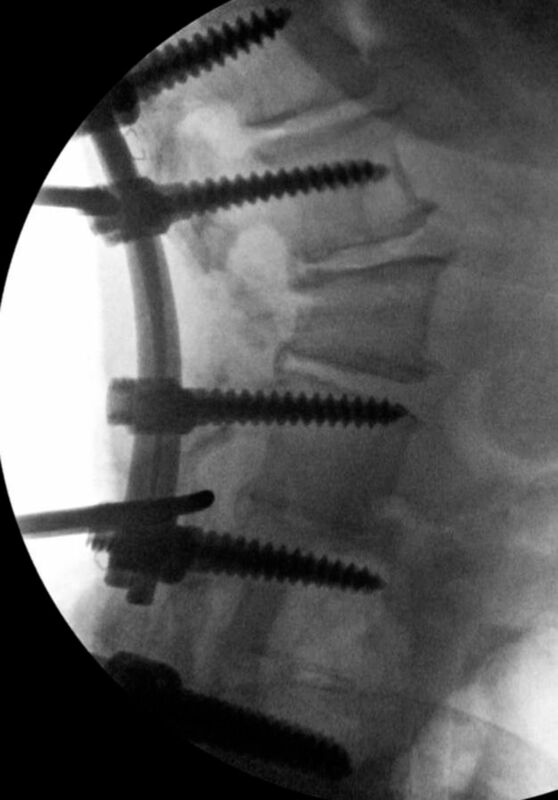 Closing wedge osteotomy with transpedicular fixation in ankylosing spondylitis. Clin Orthop Relat Res. 1992;(279):122–126. Clinical outcome results of pedicle subtraction osteotomy in ankylosing spondylitis with kyphotic deformity. Spine (Phila Pa 1976). 2002;27(6):612–618. Transpedicular decompression and pedicle subtraction osteotomy (eggshell procedure): a retrospective review of 59 patients. Spine (Phila Pa 1976). 2002;27(21):2338–2345. 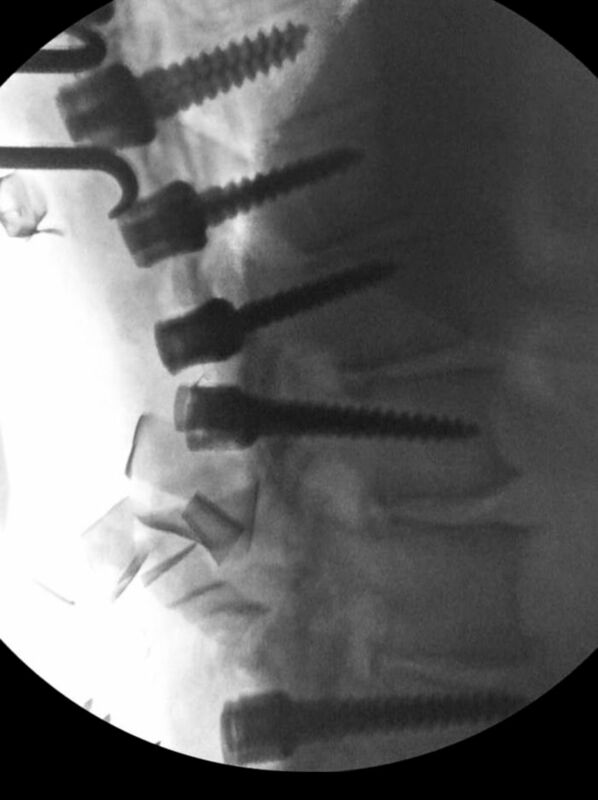 Transpedicular decancellation closed wedge vertebral osteotomy for the treatment of fixed flexion deformity of spine in ankylosing spondylitis. Spine (Phila Pa 1976). 1993;18(16):2517–2522. Vertebral osteotomy for correction of kyphosis in ankylosing spondylitis. Clin Orthop Relat Res. 1985;(194):142–152. Closing-wedge posterior osteotomy for ankylosing spondylitis: partial corpectomy and transpedicular fixation in 22 cases. J Bone Joint Surg Br. 1995;77(1):117–121. Management of rigid post-traumatic kyphosis. Spine (Phila Pa 1976). 1996;21(19):2260–2266. Clinical and radiographic outcomes of thoracic and lumbar pedicle subtraction osteotomy for fixed sagittal imbalance. J Neurosurg Spine. 2006;5(1):9–17. Neurologic complications of lumbar pedicle subtraction osteotomy: a 10-year assessment. Spine (Phila Pa 1976). 2007;32(20):2245–2252.